Morning meditation is good for your mind, body and soul. There are so many benefits to doing morning meditation, but often times, it is hard to know how to get started or what to do. This technique is one that I am currently using as I do consider myself a beginner but already read all the tutorials and saw all the techniques to quite the mind, I still felt like I needed more direction. Yes, I get it, breath in and out and relax, but then what? I decided to look for a guided meditation, I found a two minute video from Deepak Chopra Powerful Daily Medation and found it useful. he says to think the word “just” on your breath in, and the word “this” on your breath out. This was helpful for me, as I used to just think of the word “in” and “out” when doing the breathing, but somehow the words “Just this” makes my body relax, it says, meditation is easy, just focus on this, right here, right now, just 5 minutes. You don’t always have to spend 45min or 30 or 1 hr. you can do it with the little time you have today. The important thing is not how long you do it, but the consistency of doing it. So just changing that part in my technique makes me already feel better. The next part, was that I could sit down and be quiet, and wait until the universe sends me some aha moments, some deep inner knowledge. Other days, I am not in the mood for such deep analysis, I rather do something light, focus on some positive energies about the world and set an intention for the day. I decided to follow a 5 minute guided meditation I found on Youtube. I chose it because it was guided and because it was 5 minutes. Today, I only had 5 minutes. on top of this video, I selected one card that called my attention from the Universal Wisdom Oracle Cards (Oracle Card Series) what does that even mean? it means, I would choose one random card, either shuffling the cards and letting the universe give me the card to set my intention for the day, or I would browse really quickly and see which card I was attracted to or “which card called me” to focus on. The chosen card was Rainbow Wings. With my card selected, I let the universe communicate with my unconsciousness and let me know what I needed to know. I didn’t put pressure on trying to get some visuals or aha moments, I just let the day flow. So go ahead, you try it, select a card, sit in a comfortable quiet place, and press play on the below youtube video. Let me know your experience with a short meditation exercise like this one. A rainbow is the aura of an angel’s wings, which shines even in the midst of storms. It lifts the spirit and gives us hope; rainbow shine light into our hearts. Awaken the child within you and remind yourself of the beautiful and simple things in life. By guiding you to this card, the angels are confirming that you are on the right path. They ask you to keep focused on your dream and to honor your inner child by doing more of that which brings joy to your life. Even though you may be experiencing some set backs, you are urged to continue to follow your heart. Do not give up hope, for all will soon fall into place. Draw a picture of a rainbow and pin it to your wall. 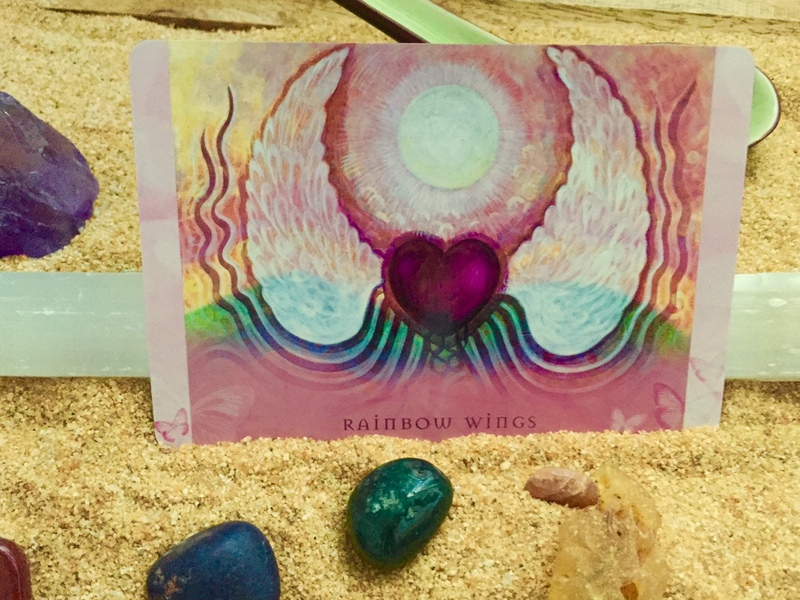 Imagine yourself protected and guided by your rainbow. Ask your angels to light your path and guide you in all you do. Sit quietly and imagine yourself surrounded and infused with the beautiful healing colors of your rainbow. It’s healing vibrations will inspire you to pursue your dreams.